XenaManager-2G test software (XM-2G) is used to configure and generate streams of Ethernet traffic between Xena test equipment and devices under test (DUTs)at all speeds up 100Gbps, and analyze the results. The user-friendly interface makes XenaManager-2G test software an effective tool for performing a wide range of core test scenarios for network equipment manufacturers (NEMs), network service providers, research organizations, enterprise, government and conformance testers. Below: This screen shows a stream statistics chart where the latencies of two streams are displayed in real time. The port and stream configuration grids let test engineers quickly view and work with a numerous ports and streams simultaneously. The traffic streams can be shaped to match very specific real-world scenarios using a wide range of variables. The packet editor function supports both protocol (IP, VLAN, UDP, etc.) and byte-level packet definitions, and the packet capture function can also automatically decode the packet content at the protocol level. 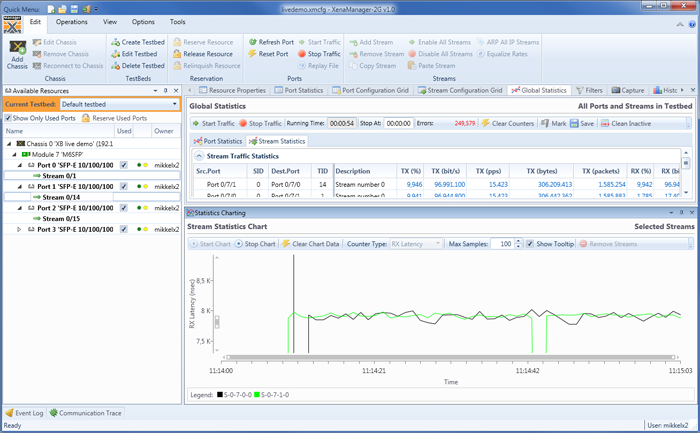 XenaManager-2G also makes it easy to quickly view and analyze traffic statistics, payload errors, latency and jitter. set up specific filters for incoming traffic, and perform real-time capture of packets. The XenaManager-2G test software offers many ways to streamline testing. These range from being able to copy and paste stream definitions across ports quickly customizing the GUI to match the test engineers’ needs by e.g. letting them hide irrelevant controls etc so they can better focus on the task they are currently performing. Once test-beds and test cases have been configured, they can by saved and shared with other users. XM-2G can be used by multiple users in different locations to manage multiple Xena chassis simultaneously.